After having made several brief visits to allow himself to better know our life, Chris Davies resided with us for the month of August as an observer. Chris is a native of South Carolina and lives in Mount Pleasant. He works in the computer programming field and has been more and more drawn to the contemplative way. Transitioning for this time at Mepkin was a real shift in gears for Chris as only days before he began his month of observership he had just returned from World Youth Day in Rio de Janeiro. The abbot, Father Stan, asked Chris to speak with the monastic community in chapter sharing some of the experience of being with Pope Francis and the many who had journeyed to Brazil for this event. For Chris, his involvement with the Young Adult Ministry of the Diocese of Charleston has proved enriching to the development of his spirituality and helped to deepen the yearning for a fuller relationship with Christ. 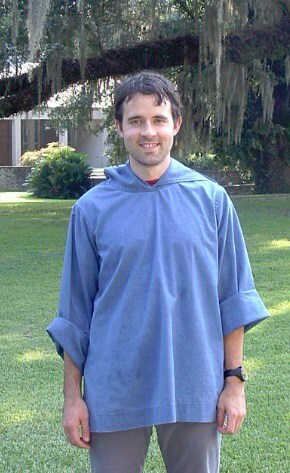 During his time in discernment at the Drexel House under the auspices of the Vocation Office of the Diocese of Charleston, Chris’ appreciation grew for the liturgy of the hours and praying in community. Kindly remember Chris in your prayers as he continues to discern. And please pray for the other thirteen men who are in contact with us to explore a possible vocation to the contemplative monastic life.